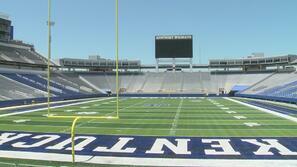 UK's Commonwealth Stadium is Finished! 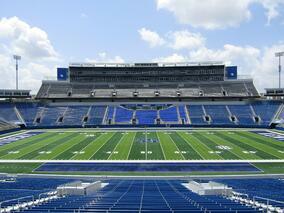 Last month I wrote an update blog on UK's Commonwealth Stadium. We were in the midst of adding backrests to the lower bowl stadium seating. Well, I am happy to announce that we are finished! As I said in the last blog post, last year we installed backrests to a portion of the lower bowl, so this year, the powers that be at UK came back and asked us to outfit the remaining lower bowl with backrests. 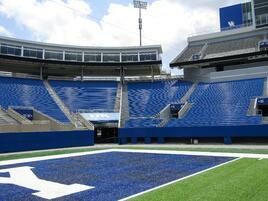 As you can see from the pictures the backrests have changed the complete look of Commonwealth Stadium. If you would like more information on how we can help you design your next set of indoor/outdoor bleachers or have questions about athletic equipment, please call 877-211-6925 or visit our website at toadvine.com and one of our sales representatives will be happy to assist you. Here at Toadvine Enterprises we are entering our busiest time of the year. We have several indoor bleacher jobs and outdoor stadium seating jobs on schedule as well as several maintenance and inspections on athletic facilities throughout the states of Kentucky, Tennessee, Indiana and Ohio. 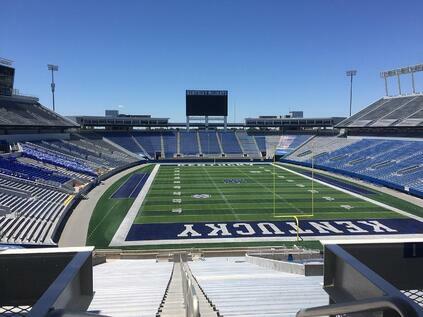 One of the bigger jobs we have going at the moment is the addition of backrests to the lower bowl of the University of Kentucky's Commonwealth Stadium. Last year we installed backrests to a portion of the lower bowl, so this year, the powers that be at UK came back and asked us to outfit the remaining lower bowl with backrests. We are excited as it will not only add comfort to the fans in attendance but also change the look of the stadium by adding more color. 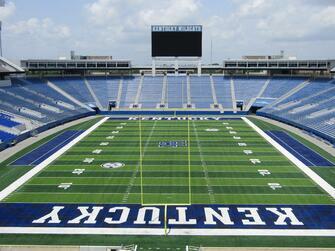 We enjoy our great relationship with the University of Kentucky and look forward to many more projects with them! If you would like more information on how we can help you design your next set of bleachers or have questions about athletic equipment, please call 877-211-6925 or visit our website at toadvine.com and one of our sales representatives will be happy to assist you. Below is an update photo from the jobsite. As you can see in the picture the sections in the far endzone are nearing completion.